The 10th annual Earth Festival will take place on Saturday, May 4 from 10 a.m. to 2 p.m, at Croft Farm. 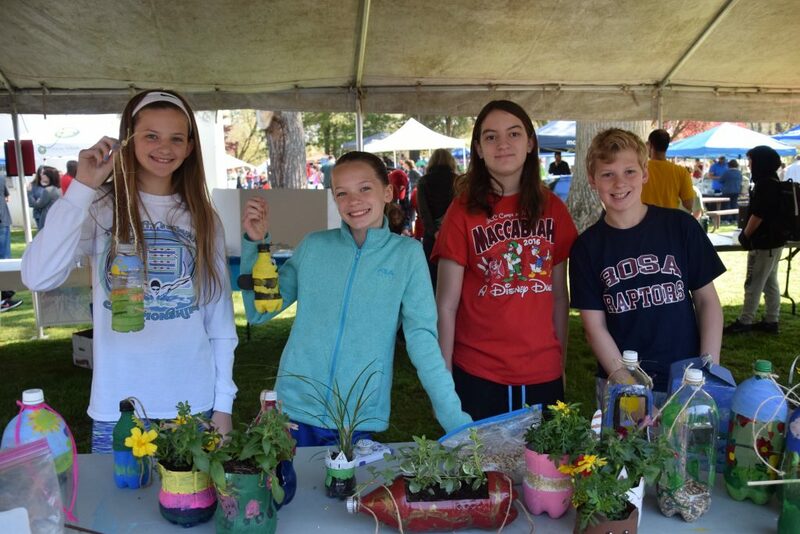 Rosa International Middle School students Jenna McGovern, Nadia McGinnis, Hannah Sibony and Mason Rosenbaum display plastic bottles reused as planters at the 2018 Earth Festival. May 4 will mark a major milestone for Sustainable South Jersey. The organization, which recently rebranded itself from Sustainable Cherry Hill, will be hosting its 10th annual Earth Festival next month. The event will take place on Saturday, May 4, from 10 a.m. to 2 p.m. at Cherry Hill Township’s Croft Farm. Festival producer Brenda Jorett has been involved with Earth Festival for most of its existence and has seen the event’s popularity and influence grow since it debuted in 2010. Caren Kaufman, vice president for Sustainable South Jersey, believes Earth Festival has helped educate residents about sustainability over the past decade and will continue to do so into the future. The biggest change Earth Festival has seen has been its growth from a local, townwide event into a regional one. Kaufman said the organization does a lot of work with inviting green teams and organizations from across South Jersey to get involved with the festival each year. This year’s Earth Festival is retaining many of the same activities guests have enjoyed in past years. The festival is keeping its theme from 2018, “Reduce Plastic – Fantastic.” Jorett said Sustainable South Jersey decided to retain the theme around cutting down single-use plastic since it remains such a major environmental issue across the globe. Attendees at the festival are asked to bring a reusable water bottle rather than a single-use plastic water bottle. One of the returning activity tables from last year will allow kids to create a project using plastic bottle caps. About 75 groups will have tables this year, from Cherry Hill Township’s public schools to green organizations from all over the region. Numerous vendors and businesses will also be in attendance. There will be plenty of green activities as well, including a plant swap and a free tree seedling giveaway sponsored by the New Jersey Tree Recovery program. There will also be two stages of entertainment at the event. A full list of vendors and entertainment will be posted soon to https://sustainablesouthjersey.org. The event will also have plenty of food options. Flying Fish Brewing Company will have a beer garden on site for the second straight year. There will also be healthy food vendors at the event selling vegan, vegetarian and gluten-free options. Jorett said the organization has seen a boost in the number of sponsors and vendors involved in this year’s event. Earth Festival is Sustainable South Jersey’s biggest fundraiser each year, with the money used to fund grants to support local sustainable efforts. In early April, the organization awarded more than $17,000 worth of grants to fund various green projects across the area. A Family Fun Bike Ride will precede the festival on the morning of May 4. The bike ride kicks off at 9 a.m., with registration opening at 8 a.m. People ages 8 and up can participate in either a two-mile or nine-mile bike ride. A free bike valet will be available at the festival to allow riders to safely park their bikes. All attendees are encouraged to ride a bike or carpool to the event. Earth Festival will be open from 10 a.m. to 2 p.m. on May 4. The event will take place, rain or shine. It is free to attend and open to the public. To register for the bike ride or for more information on the festival, visit https://sustainablesouthjersey.org/earth-festival.